Christmas time is hard for me to get inspired when it's still steaming hot outside and the beach life is everyday life. You would think that after many years, I would get used to the fact that I live in sunny Florida and it's hot all year long. However, on this particular day of December 10th, 2017 it was 50 degrees out and I couldn't have been more excited to showcase some fall/winter looks with you all. This was probably the coldest day of the month. Layering is one of my favorite aspects of men's style. In the fall, it's easy for us to just grab a sweater or light jacket and be done with it. Knowing that in a few hours, you will probably be taking it off. I wanted to show how you can easily layer up an outfit and also create different looks with the same handful of pieces. There are numerous combinations that you can place together to create the stylish professional look. I decided to create a look at doesn't scream Christmas ugly sweater contest; yet still some holiday-spirited ideas behind the selections. First, I selected a suit from H&M with a thick wool textile. 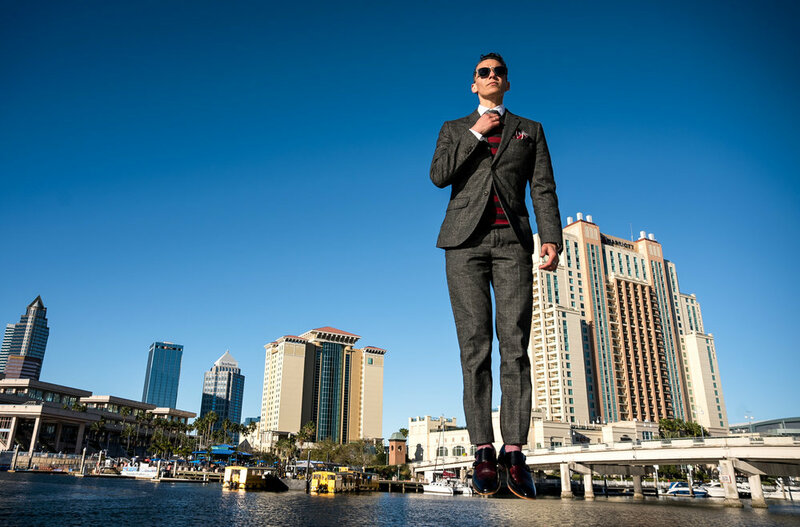 This type of suit is great to keep warm, especially your legs from traditional light weight wool fabrics. Looking at the pattern of the fabric: slight plaid with shades of grey and black lines to allude to a traditional Christmas plaid, but not loud and in your face about it. I selected a lighter shade of grey tie to match the suit and paired it with a white french cuff shirt. The tie has a slight texture and pattern up close, but from afar appears to just be a solid plain tie. I love when details appear in an outfit as you get closer to an individual. The clean white shirt is a way to make any other color in your ensemble stand out or POP. I suggest having at least 2-3 white shirts in your wardrobe at all times. Now for that Christmas charm. I added my wool sweater with deep red and charcoal strips. By itself, this sweater is bright and colorful. I love the deep red tone that it brings to the whole outfit. Ultimately, it can be viewed as a Christmas inspired outfit. The wool sweater is not too thick and can be worn under the blazer. 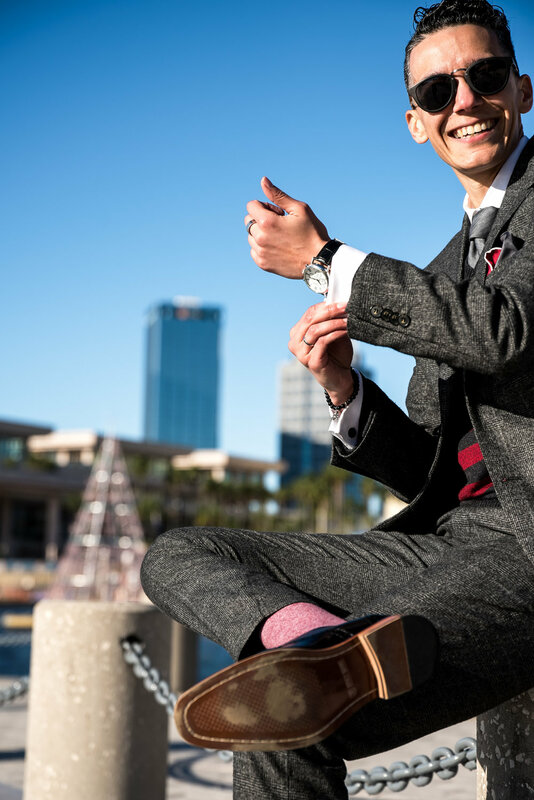 Adding a pull over is a great way to keep warm with a suit if you don't want to wear an overcoat. I added a multicolored maroon/grey silk pocket square to pull the whole outfit together. Remember, details provide opportunities for conversation. 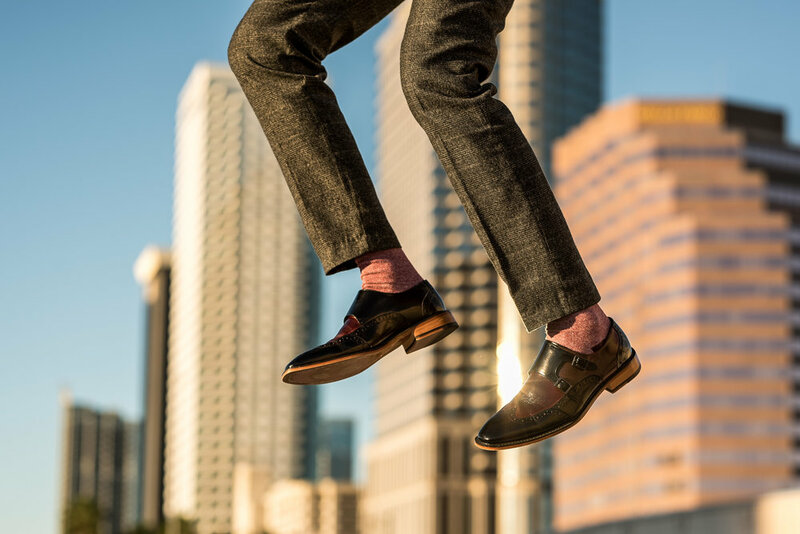 I threw on my new favorite dress shoes, two-toned monk strap shoes by Stacey Adams. Lastly, a Sharpe Suiting Overcoat. This piece is great for the cooler temperatures, which came later that evening. It fits perfectly over the suit. Or you can replace it with the suit jacket. 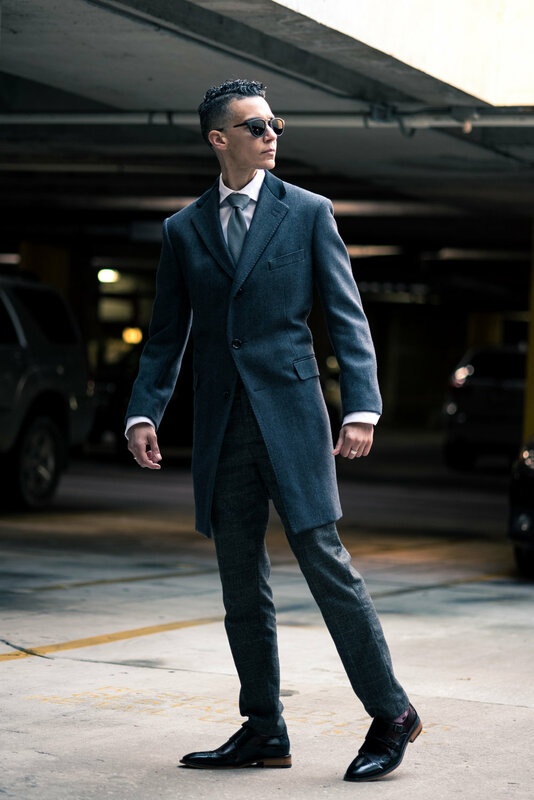 The length of the overcoat cuts the wind just right, there's something SO fun about having a long trench coat on. With all these pieces, you can see how I have collectively look different from one image to another and yet there is a hint of Christmas spirit shining through each. Have a great holiday season! Wood Shades - Archaic Co.